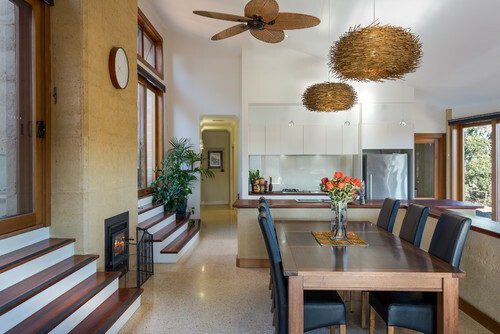 ​At Earth Homes, we specialise in building custom designed, beautiful mud brick homes to suit your chosen block. If the block already has a house on it, we can either work with the existing structure and extend and renovate, or we can remove the home and start from scratch. When considering building materials for your house make sure you know what energy is used to produce those materials? What is going into the product? It's all well and good to claim to have a sustainable home, but what are the factors? Its made from natural materials as a basic prerequisite. The walls are made from earth, straw, timber (plantation, not old growth), stone. Less carbon footprint, more natural. Is solar passively designed so it uses the sun throughout the day and seasons to warm and cool the house naturally. Has insulation in the roof. One which minimises steel, concrete and glass, as they require high energy to produce = bigger carbon footprint. Minimises the use of medium density fibreboard (mdf), plywood, glues, pvc which include toxic chemicals. Restrict off gassing and carcinogenics in your home eg. Ordinary paints, melamine in kitchens and bathrooms, minimise glues and heavily toxic products (smelly products). You breathe them in 24/7 through your lungs and skin. Eco products used are known rather than through ordinary hardware suppliers. world, or made by companies who do a lot of damage. Find out where they come from. Simple, natural products are less processed so are the best for our health and environment. Reuses or uses recycled materials. The company is sustainable and not just getting on the eco/green wagon. They walk the talk. When choosing a brick manufacturer be sure you know exactly what energy goes into making the brick and what they are putting in the brick. eg. harmful toxic chemicals, cement. Kiln fired bricks produce 6 tonnes of green house gases per 10,000 bricks (one medium sized house). Cement production produces 927kg of CO2 per 1000kg of cement. A sustainable home has a low carbon footprint and high energy efficiency through all of these principles combined. have the basics.... is it natural? Is the home made from straw, earth, timber (plantation not old growth) or stone. Building sustainably isn't rocket science. Its just a matter of mixing these important sustainable key indicators with your personal taste and what you're willing to do. home. Thats just one part of the mix. Do what you can, but if you're building from the beginning, include as much of these features to really make an impact. Earth Homes are located in the Northern Rivers of NSW, and build Mud Brick homes in Lismore, Byron Bay, Mullumbimby, Ballina, Tweed heads, Nimbin, Kyogle, Coffs Harbour.